My grandparents made my childhood. They had a cottage up by Lake Erie. It was a small cottage with wrought iron beds and an orange plaid couch. The shower was a pump shower and it was always freezing. At night my cousins and I used to play ghost n' the graveyard and during the day we would sneak into Zeller's Bar and buy rainbow pops and listen to Martika. Zeller's Beach is truly one of my favorite memories. 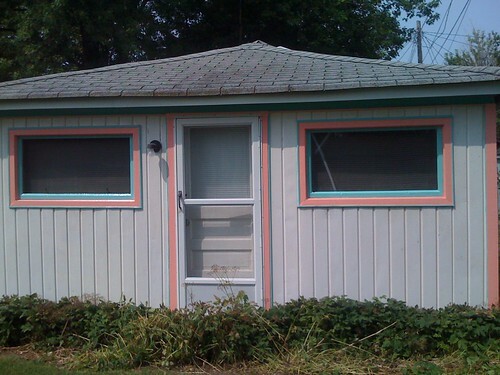 Last time we were up in Sandusky at my parent's condo, I drove by our old cottage. Still standing in it's pastel glory I was immediately taken back to those great family memories. I walked the mini's around the beach and the 'village' hoping that they would see a part of me. We walked dow to the spot where the bar was (btw who tears down a bar on a beach c'mon now) and walked to the high rocks where only the badass kids would jump off into the lake. My memories of childhood are so heavily filled with that beach and that cottage. They are truly some of the best memories I have. My hope as a mother is that someday the memories I helped create for my kids will be just as prolific as the ones my grandparents created for me.